If you generally do lots of flash or outdoor photography, and don’t tend to experience slower shutter speeds due to lighting issues, or take most of your shots at the wider end of the scale (i.e. 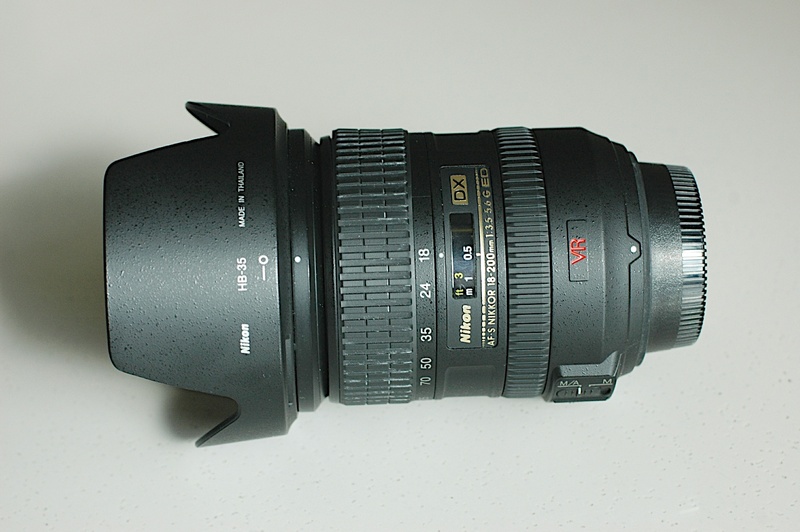 18-25mm) this lens is probably an upgrade that you can either do with or without. In the end the investment is quite small for those few times that VR might save the shot, so I would get one. Granted, VR at this level (i.e not 200 or 300mm) is less about hand shake in daylight, but more about low lighting conditions and longer shutter speeds. As for some reviewer’s comments on the default lens speed, etc. – this is a $200 prosumer lens, not a $1,500 17-55mm pro wide-zoom with f/2.8 costing 8 times what this lens costs; for the money, you can’t get anything better for a Nikon with this kind of performance. Additional notes: There is some clunking sound from the VR occasionally when focusing, and there is no hood or lens pouch included, but that’s less of an issue if, as most people do, you have a camera or lens bag, and as for the hood, I’ve never used one and never had a problem; if there’s sunglare, I can cup my hand around the lens (since it’s so light) and have no issues. I think some people use lens hoods to somehow show off that they’re “photographers” or “hobbyist-pros” rather than for the reduction of flare and glare when outside in bright sunlight (sometimes direct, etc.) or under sharp lighting. Honestly, I’ve seen guys taking indoor shots of artwork exhibits under soft lighting with the hood on. Here is a great little youtube video review of Nikon’s Nikkor 18-200mm f3.5 – 5.6 VR Lens for DSLR cameras. The video reviewer is smooth, detailed and accurate (with the exception that he intros the wrong name – corrected in subtitles) in his review, and there is alot of good information for both complete newbies and experts alike. He starts off going over the VR vibration reduction technology and why it is significant and gives us an idea of how it looks and feels; large, massive zoom, sturdy and weather proof. He moves onto explaining the other features and breaks down what makes it so versatile and powerful in strong detail in a very clear manner. The Nikon 18-200 MM is easily one of the most popular and in demand lenses ever in the Nikon Nikkor lens lineup (and you might have a hard time finding one in stock seeing as how they are so popular and get bought up fast hehe) It covers almost all the focal lengths one could ever expect to encounter in a day-to-day fashion in a single lens and does them all quite well for your average day to day type of photography. If you have a Nikon DSLR and are looking for an all-in-one type of walkaround lens, look no farther you have found it, as the Nikon 18-200mm is versatile enough that it could replace a whole set of lenses before it… now if only it were easier to find a store where they weren’t all sold out of this master-lens! I was a little snap-happy and ended up testing the crap out of this thing. It was everything you’d expect, truly the king of lenses. I found that it was perfectly sharp at every aperture. The top resolution seemed to be between f/3.5 and f/8.0 I’d say and it really didn’t start to make any noticeable difference until about f/20.0 and even then was very minimal. As for the focusing it was also perfect accuracy with the fastest autofocus I have seen on any lens. I found the closest distance I could get it to focus at was around 10 feet. It is hard to rate this lens because I haven’t seen anything that comes close to it performance wise. The visible distortion is actually zero and you can’t even see ghosts when you point right at the sun. Apparently Nikon’s exclusive nano crystal coat plays a large part in keeping these down. From what I understand this version is considerably lighter than the previous AF-S and the AF-I but still feels very solid and durable although I can’t say I’ve tested that yet, thank God. The barrel is magnesium die-cast and dust and moisture resistant. I’d say it couldn’t weigh more than 10 pounds which really isn’t all that bad to lug around with your camera if you are at all serious about taking pictures. Maybe if you are out in the middle of nowhere shooting wildlife you could find it getting to be a bit much, I’d definitely use a tripod with this thing and make sure it is very solid and very secure. I couldn’t imagine watching this baby fall over I’d have a heart attack. As for features there is really a lot for a photographer to play with. The new VR II vibration reduction supports the tripod stabilization more on my D3 which further reduces any vibrations that can be caused by the mirror slap when the shutter releases. This lens with the camera weighs about 15 pounds which is a lot when you aren’t on a tripod but I was quite impressed with the handheld photos I took. It looks like the vibration reduction works extremely well in all circumstances. For controls on it there is a focus preset button that recalls a preset focal point, a focus limiter that can keep the AF-servo movement in a specific distance range, a switch to lock the focus, and one to engage the autofocus. I will remember my short time with this amazing lens by my absolutely beautiful pictures and I am going to have a hard time taking nature pictures with anything else. I really didn’t have any problem carrying this thing around like I thought I might have and I’m for the first time considering purchasing a lens this expensive. If seeing is believing then I believe it is worth every penny. To all the people out there unsure because reviews of this model are hard to come by you had seven days to return it for a full refund from amazon.com and it also comes with a five year warranty. After seven days you won’t be wanting to return it, believe me.